Keep your “team” satisfied with hearty and nutritious snacks such as nuts (almonds, peanuts, pistachios & walnuts), cheese, dried fruits (apricots, cranberries, raisins), raw veggies with light ranch dressing and popcorn! Delightful Dips. choose hummus, guacamole, salsa and bean dip – pair with raw veggies, whole grain crackers and baked corn chips. Heat it up at half time! Before half time starts, preheat your oven to make warm and hearty snacks. Melt cheese over crackers, veggies, or hot sandwiches. Reduced fat cheeses can have as much as 33 percent less fat than regular cheese! Power up with protein – prepare lean turkey burgers, chicken or beef kabobs, black bean burgers or lean steak sandwiches – easy to prepare, delicious options that are high in protein. Cozy up with chili – Prepare chili using the leanest beef or turkey possible. In addition, use less meat and more beans to create a higher fiber and lower fat meal. Have a small snack before the party starts such as yogurt, a few nuts or fruit. This will ensure you don’t start the festivities with a ravenous appetite and end up overeating. 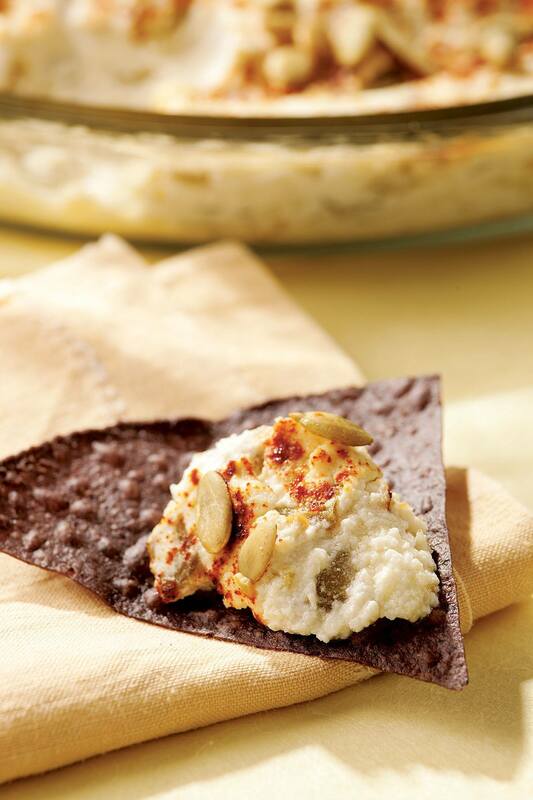 This creamy, cheesy dip is spiked with green chiles and smoky chipotle pepper. Be sure to drain the ricotta the day before you want to serve the dip. Serve with tortilla chips or crackers. Coat a glass pie pan cooking spray. Mash together ricotta and goat cheese in a medium bowl. Drain chiles in a colander or sieve, pressing to remove as much liquid as possible. Stir into the cheese mixture. Spread evenly in the prepared pan. Sprinkle with pepitas and chipotle. Bake until the dip is bubbling at the edges, about 30 minutes. Let cool for 5 minutes. Tips: To drain ricotta, spoon into a sieve lined with double layer of cheesecloth or a large coffee filter. Place over a bowl and drain in the refrigerator for 24 hours. Pepitas: olive-green hulled pumpkin seeds. Commonly used in Mexican cooking. To toast, cook in a small dry skillet over medium-low heat, stirring constantly, until fragrant and lightly browned, 2 to 4 minutes.